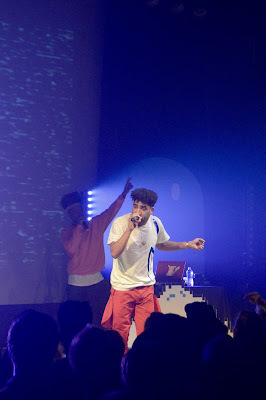 SuperDuperKyle is a California rapper with a penchant for Pokemon, fruit snacks, and throwing crazy shows. Kyle and his SuperDuper crew let loose fist-pumping jams about having fun and falling in love, danced like Kid 'n Play, and literally crowd surfed. Olathe rapper Duncan Burnett went on before Kyle and was joined by a guitar player. Burnett offers thoughtful raps, superb instrumentation, and one of the most reward local hip-hop sets. Kansas City rapper Domineko opened the show; his very masculine style of hip-hop wasn't terrible, but definitely ill-fitting considering the more upbeat nature of the rest of the show. Yung Grandpa played a DJ set that included Chief Keef and Soulja Boy.